LED’s ARE THE WAVE OF THE FUTURE! LED’s are the most efficient way of lighting today, the LED is 80% more efficient than the standard incandescent light bulb or fluorescent tube. LED’s have a life expectancy of 100,000 hours. This is 11.4 years if the LED’s are on 24 hours a day. LED’s are very durable and they are suitable for indoor and outdoor use. LED’s work great in all kinds of weather conditions. The Standard fluorescent 60 x 2 = 120 watt tubes uses over 1 kwh of electricity every 24 hours; this has a minimum cost of $ 0.39 per 24 hours. (depending on cost bracket). LED’s = $11.70 - 80% = $2.34 per month . . Savings of $9.36 per month. Fluorescent glass tubes have mercury in them in order to work. Fluorescent tubes have to be changed usually with in a year. Fluorescents also have the danger of the glass tube breaking. LED’s are 99.9% solid, the material used in building LED’s is epoxy. Epoxy is a very hard durable chemical compound that will withstand most conditions. Reduces approximately 80% of the power consumption compared to traditional light sources. As a solid state device, can be used in applications with certain impact or vibration. Easy to apply to any design. Can be used on AC or DC circuits. Excellent for usage on microcontrolled systems. 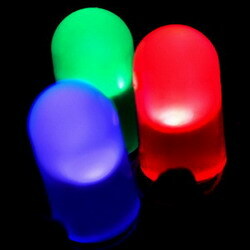 Excellent for designing multicolor (RGB) lighting devices. Very fast off-on on-off time response. Custom made allows easier installation. We have a very wide variety of LED's and LED assemblies, in different shapes, sizes and opto-electrical characteristics, thus you can find the right device for your specific application.